It’s the subtle interplay of light and darkness, the right angles, and the perfect vantage points that photography enthusiasts are really after; and what better muse than the glorious Taj Mahal? 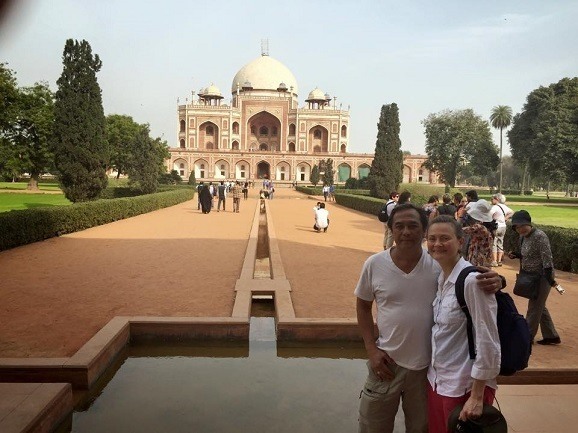 Before her visit in February, 2015, Jen Perena had planned out her day at the Taj and yet, she found that her guide had some different advice. Did she get the money shot? Read on to find out. Seeing the Taj Mahal in person, as well as at sunrise, sunset and in the light of the full moon, had been a dream of mine for a long time. As an avid amateur photographer, and someone who has seen so many different images of the Taj online, in books and in the photos taken by other friends who had traveled to India, I had a romantic vision of exploring the light, the angles, the gardens and all the various facets of the complex with my camera throughout an entire day. 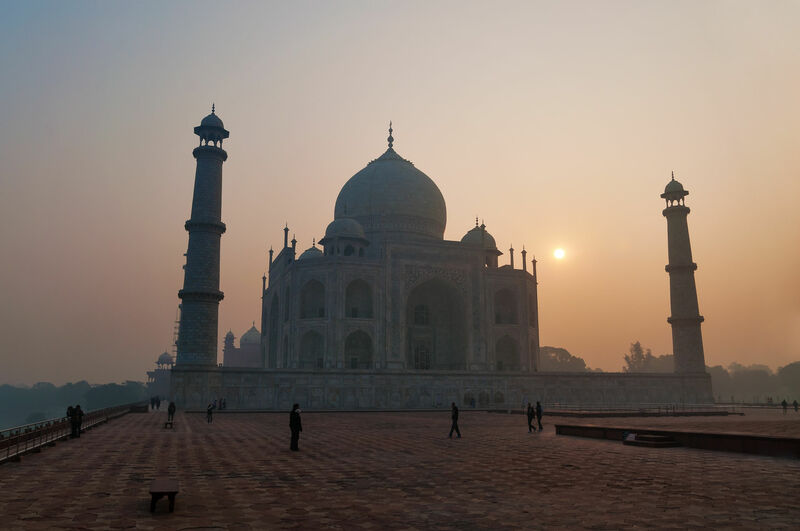 When we arrived in Agra, we spoke to our guide to arrange a meeting time to visit the Taj Mahal the next morning. 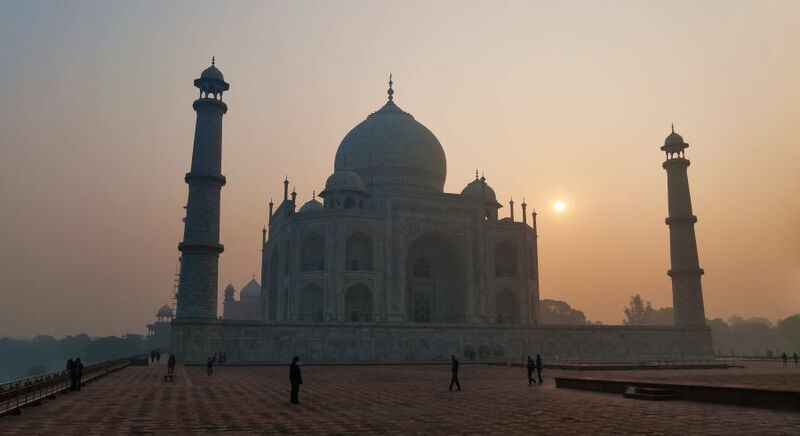 While he gently encouraged us to relax at the hotel in the morning, sleep in and have breakfast, and then meet around 9 am to go over to see the Taj, I was adamant that we stick with my plan and get up at the crack of dawn to see the bluish light of morning on the surface of the grand building. He reluctantly agreed, without telling me his justification for why we should do otherwise, and I went to bed happy with anticipation of the next day’s adventure! We awoke at 5 am, too early to have breakfast at our hotel, met with our guide and driver at 5:30, drove to the southern gate, and got in a very long line with other travelers hoping for the same experience. What we did not know was that due to increased security measures, the gates didn’t actually open until 5 minutes AFTER the sun had already risen! The two lines, one for men and one for women, started to slowly move, and the visitors were screened for weapons or contraband. This took well over an hour, and by the time my husband and I reached the main security, I was very disappointed as the blue cast of the early light was already turning yellow, and the sky was quite bright. As we had chosen to bring a backpack with us to hold water bottles and a video camera, we were also held in the line longer than others, so that the very thorough security team could fully check our bag. By the time we entered the gateway to the Taj, two hours had passed. As we turned to look back towards the gate, we noticed there was no longer any line and new visitors were easily breezing through to security to come where we were – which we could have done if we had slept in and had breakfast! At that point I gained a new appreciation for the advice I had not taken, and started listening to our guide…. We were at the complex for a full 4 hours and I am pleased with the images I shot. The prospect of returning for the afternoon sun/sunset and the almost-full moon was still exciting, since that was the day before the full moon. Once again, as I expressed my ideas for the rest of the day, our guide gently suggested that rather than return and pay to enter the complex again to get the same views in a different light, we take in the Taj from across the Yamuna river, in the Moonlight Garden. We wouldn’t be as close to the Taj, but would get a totally different perspective. Throughout the day my thoughts kept returning to how the Taj would look framed by the Moonlight Garden. As the afternoon wore on and we started to make our way to the garden, we got stuck in a traffic jam. Our guide made some calls and determined there was no way we would be able to get to the Garden by sunset. So he came up with an alternate plan for us to walk down to the bank of the Yamuna River from another entrance and view the Taj along the river. We thought it sounded good and really enjoyed the spur-of-the-moment change in plans, and the very unique view of the Taj the new spot afforded. We stayed there at the river’s edge enjoying the view until the moon started to rise. At this point I voiced my idea to return to the Taj to see the building one last time in the moonlight from within the complex itself. Once again, our very sage guide weighed in with a reality check: night-time visitors were only allowed 30 minutes to see the Taj from the main gateway (i.e. we wouldn’t be allowed to walk around the inner gardens). It would take just about that long for our eyes to adjust to see the Taj in that dim light (since the Taj is otherwise not lit by any man-made light), and it would be very difficult to get any photos, since tripods are prohibited and holding a camera in hand for a very long exposure would be a challenge. He also told us that other visitors who had paid to enter again had felt disappointed. After a wonderful day of experiencing the Taj from two vantage points, along with all our other experiences in Agra, I was more than willing to take this final bit of advice, and so we remained by the river until I could get some shots with the full moon overhead. Overall it was a wonderful experience and one that would only have been enhanced had we fully trusted in our guide and listened in the first place. It was a lesson we learned well that day and from that point on, we engaged our guides for their tips and their experience and never felt that we missed out. In fact, we felt very lucky to have had such great guides, as many of our experiences were definitely unique! 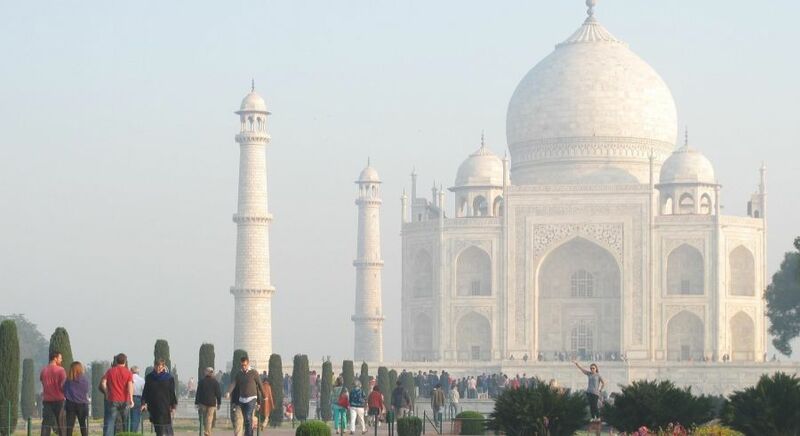 Plan your trip to see the beautiful Taj Mahal in Agra. Contact us for your tailor-made tour itinerary. 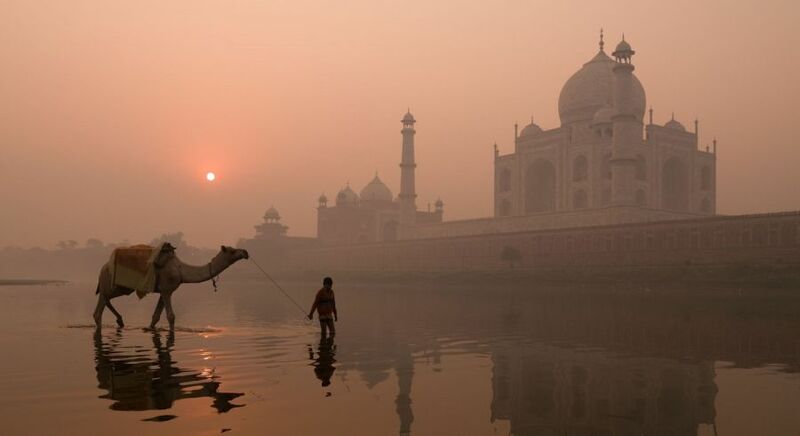 Feeling inspired to make your own trip to the Taj Mahal? Click here to book your trip.